I have been hiking and camping for over 20 years and enjoy backpacking solo and with my kids in Scouting. I especially enjoy fall and winter backpacking and camping. My backpack and gear are older and weigh 40+ lbs (18 kg). This has limited the distances I have been able to cover while hiking. My goal over the next several years is to replace my existing clothing and gear with more suitable and lighter weight alternatives. Infinite Guarantee - We (OR) believe so strongly in the quality of what we make that if, at anytime, our product fails to meet your needs, we are happy to exchange or return it. Because of this solid belief, our products are guaranteed forever and are designed with this in mind. Your total satisfaction in our product is our goal. The Dune shirt is a short sleeve, collared button-up shirt made of Dri-release fabric, which is a lightweight blend of cotton and polyester. Dri-release fabric is touted as being quick drying as well as wrinkle and odor resistant. The shirt boasts clean lines and a simple design with a single chest pocket for hikers, travelers and other outdoor enthusiasts. I was excited about the opportunity to test the Dune shirt as Outdoor Research (OR) does a nice job designing outdoor clothing. Prior to receiving it, I checked out OR's website to view the Dune shirt, along with its features and sizing chart. Based on the sizing chart I chose a men's small in the color 'Sea' blue. The Dune shirt arrived in excellent condition and looked exactly as it appeared on OR's website. It is a stylish design with straight hems featuring 2 inch (5 cm) bottom splits for added styling. The shirt sleeves feature the same splits in a smaller 1 inch (2.5 cm) format. The left side chest pocket sports a 0.5 inch (1.7 cm) embroidered OR logo while a larger stitched OR logo is visible on the back left shoulder of the shirt. 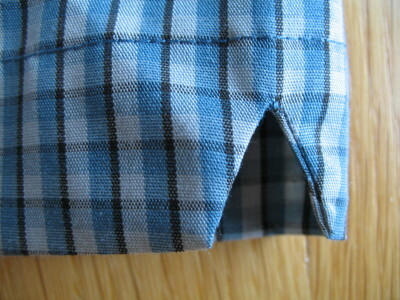 The shirt placket is 1.25 inches (3.2 cm) wide with stitching down each side. The stitches are inset 0.25 inches (0.64 cm) from each edge. Seven small buttons are evenly spaced on the placket while an extra button is sewn onto the care tag, just in case. As the buttons appear to be plastic and are simply sewn in place, it will be interesting to see how sturdy they are and whether they loosen or fall off over time from the force of weighted backpack straps tugging at them. After trying on the Dune shirt, I would not describe it as relaxed fit. It feels more fitted. In my case it is snug around my arms pits and feels narrow across the shoulders. I hope this does not create problems while using hiking poles or performing camp chores. I could probably have ordered a Medium but I made my selection based on the sizing chart and the fact that the shirt was described as having a relaxed fit. Regarding its weight, the Dune shirt is definitely lightweight. 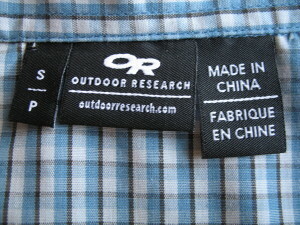 The Sea blue color is accurately depicted on Outdoor Research's website, and is very sharp in appearance. 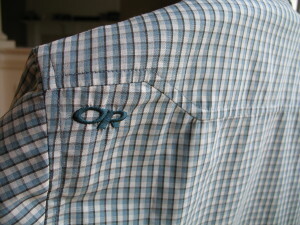 The Polyester / Cotton blend of the OR Dune shirt is very comfortable against my skin and I have not noticed the seams or surprisingly the three hang tags on the inside collar of the shirt. The shirt breathed well during my initial use at my son's baseball tournament and was fairly comfortable to wear as long as I didn't move around too much. The Dune shirt is well-made and the quality shines through with precise stitching and straight seams. I look forward to wearing the OR Dune shirt a lot in the next few months. The care instructions are detailed on a black tag which is sewn to the bottom left side seam of the shirt. 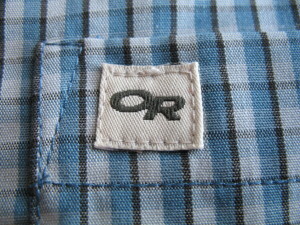 Three smaller tags are sewn to the inside collar of the shirt. The first tag indicates the shirt size. The second tag has OR's logo on the front and the words 'infinite guarantee' along with an 800 phone number on the back. The third tag says 'Made in China'. The Outdoor Research Dune shirt is a well made short sleeved button down shirt that appears ideal for backpacking in warm summer months. I plan to test this shirt in a variety of conditions and report back on its comfort and functionality. This concludes my Initial Report. 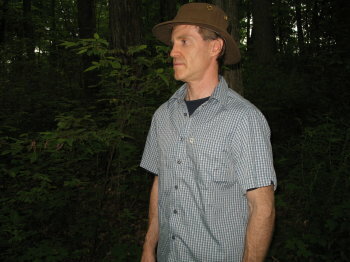 Many thanks to Outdoor Research and BackpackGearTest.Org for the opportunity to test this shirt. During this test period, I have worn the OR Dune Shirt for a total of 7-nights in the field, including three separate overnight backpacking trips. I have also continued to wear this shirt around town and at home. Daytime temperatures during the past two months averaged 86 F (30 C) with highs ranging from the mid 90's F (34 C) to over 100 F (38 C). 1. Brown County, Indiana: My first trip during this test period was a two day backpacking trip of approximately 10 miles (16 km). Although temperatures were in the upper 80's F (28 C), the humidity was relatively low which made things pleasant. Nighttime lows were in the 70's F (22 C). The terrain was hilly and heavily forested. 2. Roaming Shores, Ohio: This was a four day hiking and fishing trip to Northeastern Ohio. The terrain was moderately hilly and there was lots of forested area. Temperatures ranged from the mid 90's F (34 C) during the day to 75 F (24 C) at night. Our camp elevation was approximately 870 ft (265 m). Skies were sunny for most of the week and there was a slight breeze most days which provided some relief from the high humidity. 3. Oldenburg, Indiana: The weather during this two day trip was sunny and humid with temperatures in the mid 90's F (34 C). The terrain was hilly with a mixture of open fields and wooded areas. 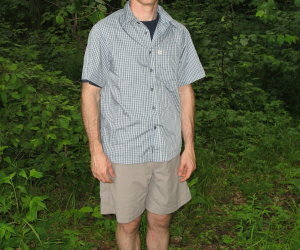 The OR Dune shirt has proven to be a very good summer hiking shirt. In addition it has a clean, simple design that looks good when venturing into town after a weekend in the backcountry. It is a great addition to my wardrobe for backpacking and hiking. Performance: The Dune shirt has performed very well in the areas of breathability and moisture management during my past two months of testing. While hiking in hot, humid weather it has done a great job of moving moisture away from my body and then allowing it to evaporate. This was evidenced by the fact that the back of my shirt and the arm pit areas would become quite damp while I was backpacking, yet these areas dried quickly once I stopped for awhile or took off my pack. The Dri-release fabric appeared to be doing its job quite well. Another nice feature of this fabric is that it doesn't seem to retain odors. After four days of hiking in Roaming Shores, OH in hot, humid weather I did not notice any unusual odors. As the shirt is snug on my body, it always stayed in place and did not bunch up or twist around my torso while wearing a backpack. I have not encountered any discomfort from the shirt seams rubbing against my skin. At this point I am very happy with the performance of the shirt, and look forward to two more months of testing through the fall. Comfort and fit: Although the Dune shirt is soft against my skin and comfortable in general, it remains snug around my arms pits and continues to feel narrow across my shoulders. During this test period I noticed this most when I extended my reach or stretched out. As my body profile is not out of proportion based on the manufacturer's sizing chart and the shirt is described as being relaxed fit, I believe the sizing is off slightly. Once again I have not noticed any rubbing or chafing of the seams against my body or neck. The sleeves of the shirt are a comfortable length, and have a large enough circumference to keep them from binding on my biceps. Durability: So far I have had no problems with durability. The shirt seams have remained tight and the material edges have not frayed. There has been no deterioration of the fabric or any loose threads or pilling. The stitching and workmanship remain fine. While backpacking in the woods there were plenty of opportunities for the shirt to get torn on briars, tree branches or rocks. Luckily I have yet to snag the fabric or tear a seam. The shirt has shown no sign of wear from any of my adventures. In addition, this shirt has shown no signs of fading or other color changes despite numerous washes. It cleans well, dries quickly after laundering and does not appear to shrink. 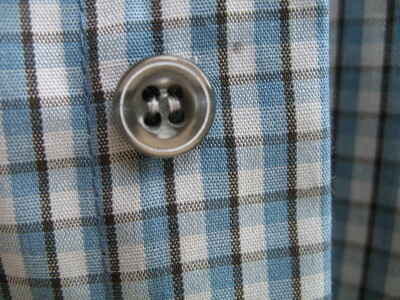 The fabric appears durable and after several months of use the shirt still looks brand new. My experience with Outdoor Research in general is that they produce good quality products and this shirt exhibits an attention to detail that is apparent and appreciated every time I put it on. I really like this shirt. It fits well, and is comfortable to wear on the trail and around town. It is definitely on my short list of items to take on backpacking trips during summer months. Thanks to Outdoor Research and BackpackGearTest.org for the opportunity to test this shirt. During this test period, I wore the OR Dune shirt for a total of 5 nights in the field, including two overnight backpacking trips and one day trip. I also wore this shirt at home and around town on weekends. Daytime temperatures during the past two months averaged 74 F (23 C) with evening and nighttime temperatures dipping into the mid 60s F (17 C). 1. Hoosier National Forest, Indiana: My first trip during this test period was a three day backpacking trip of approximately 12.5 miles (20 km). Temperatures were in the mid 80s F (28 C), and the humidity was high making this a good test for the Dune shirt. Nighttime lows were in the low 70's F (22 C). The terrain was hilly and heavily forested. My camp elevation was approximately 840 ft (256 m). Skies were sunny for most of my trip but there was a slight breeze most days which provided some relief from the high humidity. 2. Oldenburg, Indiana: The weather during this three day trip was sunny and humid with temperatures in the low 80's F (28 C). The terrain was hilly with a mixture of open fields and wooded areas. 3. Winton Woods, Ohio: This was my first time back to Winton Woods in many years. The terrain was moderately hilly and there was lots of forested area throughout the park. Temperatures ranged from the mid 70's F (23 C) during the day to the upper 60s F (20 C) at night. The Dune shirt has performed admirably during my last two months of testing. It is lightweight and comfortable to wear while backpacking in warm weather. It also breathes well in hot conditions and dries very quickly after a soaking. On my hike around the Grupp Ridge Loop in the Hoosier National Forest, I was sweating hard within an hour of starting out. The Dune shirt with its Dri-release fabric did a great job of wicking moisture away from my skin to the outside of the fabric where it could evaporate. After stopping for lunch for 20-30 minutes, I noticed the shirt had completely dried out despite the fact that I was sitting in the shade and it was fairly humid conditions. Due to its fit, the Dune shirt has also done a good job of accommodating my pack straps without any uncomfortable bunching of fabric. Another big plus has been that the shirt collar is tall enough to block the sun from burning my neck, unlike a T-shirt that has no collar. The short sleeves and thin fabric make this shirt perfect for hiking in warm weather, although the unseasonably cool fall weather this year has forced me to switch to warmer clothing earlier than expected. There is not too much more to say about the Outdoor Research Dune shirt besides what I have already reported. It is a great performer that does its job with style. Regarding durability, the Dune shirt has held up well in the washer with no fading or bleeding of colors. It is in good shape except for some light pilling that has developed around the collar. I have yet to place it in the dryer since I normally hang my clothes out to dry. The shirt dries quickly after it is washed and as mentioned above, when it becomes damp from perspiration while backpacking. The shirt is easy to pack, and wrinkles smooth out fairly quickly after being unstuffed from a pack. Finally, all of my buttons remain securely fastened, and in good working order after 4 months of use. 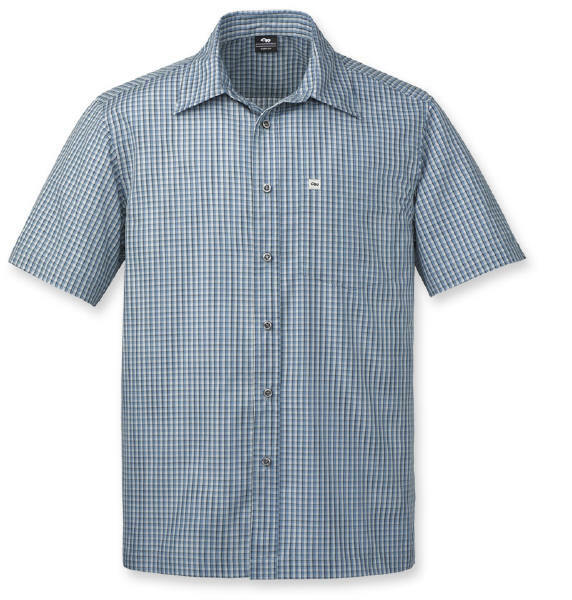 The Outdoor Research Dune shirt is an excellent all around summer hiking shirt. It is well constructed and made of durable fabric. The design is stylish enough to allow it to be worn in town. The shirt fits me somewhat tight around the chest and shoulder area, but this is more of an issue with my build than with the shirt itself. The Dune shirt is comfortable to wear with a pack, provides adequate sun protection and dries quickly. I am very happy with the performance of the shirt and look forward to wearing it next summer.